Faiez Serraj photographed by fellow journalist Hamza Turkia at KM 27 checkpoint today (Photo: Hamza Turkia). The Khalifa Hafter Libyan National Army (LNA) and its regional allies seemed to have ben repulsed overnight in their thrust towards Tripoli. The newly-formed Western Region coalition of anti-Hafter forces launched the ‘‘Wadi (Ouadi) Doum 2’’ operation to counter Hafter’s attack on Tripoli. Wadi Doum is a military airstrip build by Qaddafi in northern Chad where Hafter was defeated and captured by Chadian government forces fighting for the Qaddafi regime in 1986. Ironically, Hafter’s defeat and capture in 1987 was facilitated by French support for the Chad government at the time. Yesterday, pro Hafter media circulated video footage purporting to show pro-LNA forces capturing the strategic KM 27 checkpoint on the main coastal road between Tripoli and Zawia. Later last night, anti Hafter forces displayed footage purporting to show that KM 27 checkpoint was back in their hands. Moreover, reports, photographs and video footage widely circulated purporting to show a large number of pro-Hafter troops under arrest by the anti-Hafter forces. These are put at around 150 held in Zawia. It was claimed they surrendered without putting up any fight. They also claimed to have captured the surrendering forces’ armour and vehicles. 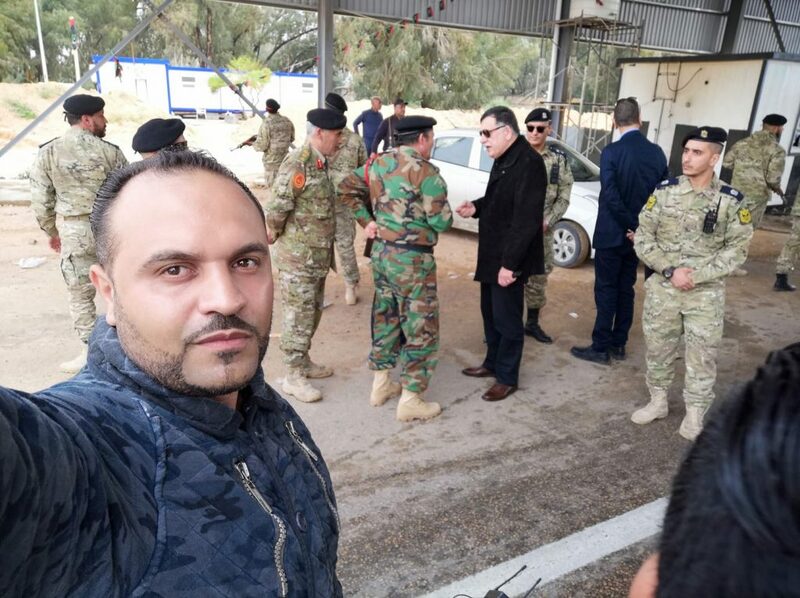 Faiez Serraj was also photographed by a fellow journalist today meeting troops at the KM 27 checkpoint, and the Tripoli-Zawia coastal road was reported to be normal this morning. There were brief clashes between the two forces reported in the Hira area at the foot of the Western Nefusa mountains yesterday. There are conflicting reports as to who controls the Witya airbase, near the Tunisian border and 75 km south of Zuwara. More importantly, there were numerous reports and photos and video footage of of Misratan forces allegedly preparing to set off to Tripoli. There are still no confirmed reports this morning of their arrival in central Tripoli. Petrol and diesel queues continue in Tripoli. In fairness, these started a few days prior to Hafter’s arrival at Gharian, but Hafter’s arrival has been the only topic of debate in Tripoli for weeks. Some would say for months and at least a couple of years. The NOC’s Brega has assured that there are plenty of fuel supplies. One black-market currency dealer reported to Libya Herald that the dinar spiked to 4.90 to the dollar briefly yesterday. A quick unscientific poll of people in Tripoli by Libya Herald this morning is as split and polarized as the British Brexit debate. Half want Hafter while the other half absolutely detest him. Tripoli is calm with many residents carrying on as normal today – as they had done all of yesterday. On the international stage, following the earlier statements by the EU and the UN yesterday, a Joint Statement on the Fighting Near Gharian was released by the Governments of France, Italy, the United Arab Emirates, the United Kingdom, and the United States was released late last night. It said that ‘‘The governments of France, Italy, the United Arab Emirates, the United Kingdom, and the United States are deeply concerned by fighting near Gharyan, Libya and urge all parties to immediately de-escalate tensions, which are hindering prospects for UN political mediation. At this sensitive moment in Libya’s transition, military posturing and threats of unilateral action only risk propelling Libya back toward chaos. We strongly believe that there is no military solution to the Libya conflict. Our governments oppose any military action in Libya and will hold accountable any Libyan faction that precipitates further civil conflict. We stand united behind UN Special Representative of the Secretary-General (SRSG) Ghassan Salamé as the UN seeks to break Libya’s political deadlock, improve transitional governance, and chart a path toward credible and peaceful elections. All Libyan actors should work constructively with SRSG Salamé as the UN finalizes plans for the national conference planned for April 14-16’’. Meanwhile, the UK has called for a closed emergency UN Security Council session on Libya to be held today.